ABOVE: Splitter columns and classic climbs span the 300-foot-long Main Amphitheater wall at the Oak Creek Waterfall. Water shapes and colors Arizona’s premier trad-climbing destination in a number of ways. The wind-whipped falls have scoured sections of rock to an alligator-skin texture and painted it hues of copper and midnight black. Groundwater seeps have left white and flame-orange streaks on sections, inspiring the names of particularly colorful routes, like A White Bread World (5.11), Black and Tan (5.10) and Pyrokinesis (5.12+). Cooling and fracturing of the volcanic rock have formed columns from five to 10 feet wide, separated by cracks. Nearly every crack system is climbable, from tiny seams to offwidths, and concentrated routes make for convenient cragging. Over the past two decades, the Oak Creek Waterfall near Flagstaff, Arizona, has developed into one of the country’s best traditional climbing areas. Stories about the beautiful splitters of Paradise Forks hint at Arizona’s wealth of excellent basalt crack climbing, but the Waterfall (as it’s called by locals) has raised the bar for quality and difficulty. Currently holding over 120 climbs from 5.10 to 5.13+, the Waterfall is the crown jewel of Arizona’s basalt climbing. Perched on the rim of Oak Creek Canyon between Flagstaff and Sedona, this expansive amphitheater of volcanic rock was deposited in a series of lava flows around six million years ago. Over time, the rushing waters of Oak Creek eroded and exposed the cliffs to form the 300-foot columns. The crag is named for a 250-foot cascade that, during spring runoff and summer thunderstorms, gushes over the center of the wall and pours down to feed Oak Creek. Tim Toula, guidebook author and first ascentionist, pioneered the first few Waterfall routes in the 1980s. He climbed the most prominent and protectable cracks: No Feelings (5.10), a beautiful twin-crack feature with an improbable roof finish, and Double Clutching (5.11-), a varied line that traverses a series of roofs. After Toula opened these climbs, several eras of development left distinct sets of routes, each concentrated on certain walls. Darren Singer moved to Flagstaff in the early 1990s and was drawn to the Waterfall by an obscure topo in Toula’s Sedona guidebook, A Better Way to Die. ABOVE: Spray from the falls polishes the basalt of the Main Amphitheater to a metallic finish while preserving friction, as Joel Unema finds on CounterCurse (5.11+). Climbing on the Left Wall begins at 5.10, and Singer opened many classics at the grade, including The Sword (5.10), a perfect orange face split by a fingers-to-fists fissure. The sweet spot on the Left Wall, however, is 5.11, with nearly two dozen top-quality pitches at the grade, including Giardia Crack (5.11+), a long hands-to-fingers crack that starts with a burly and devious roof. 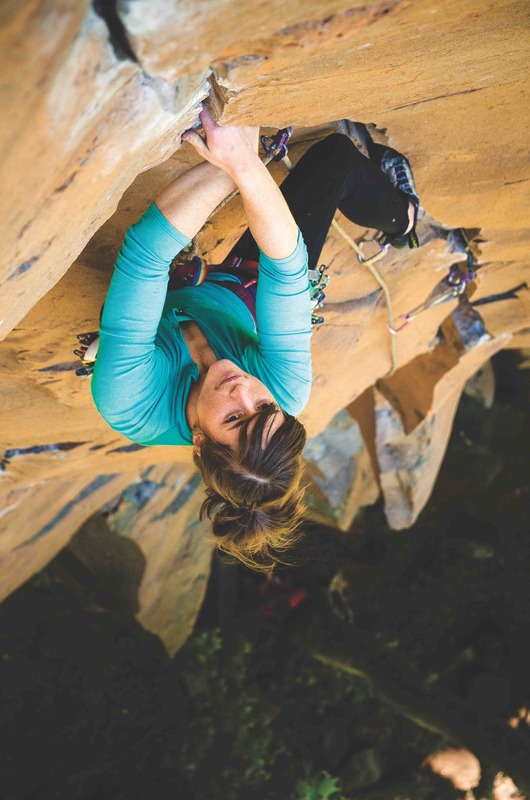 ABOVE: Locks and more locks: Ashley Maryn jams the sustained 120-foot classic Natural Enhancement (5.11). After completing most of the continuous cracks on the Left Wall, Singer turned his attention to the much thinner cracks and more varied climbing on the Right Wall. Protection, though, proved more difficult on these lines. In 1992 Singer boldly opened the Waterfall’s first 5.12. Lochs of Dread climbs a panel of deep orange alligator-skin rock split by a flared crack that tapers from thin hands to sub-tips. Shortly after Singer finished Lochs, however, Right Wall development came to an abrupt halt. Singer recalls the experience. Singer continued his work, finishing several more routes on the Left Wall, but in the following years, the Right Wall lay dormant. Continued development on the thin cracks and seams on this section of cliff called for a new set of eyes and inspiration. While Sweet Dreams and a few other routes have marginal gear and serious consequences, many climbs from this era are runout but safe. Even routes relying on RPs, Lowe-Balls and other small gear can be G-rated since the bullet-hard basalt holds almost any properly placed protection. After Foster completed his hardest, most committing routes, forever leaving his mark on the crag, he moved on. Schlick picked up the torch, however, and spearheaded the Waterfall’s next wave of development. He shifted the focus from hard-to-protect and runout routes to accessible and well-protected mixed lines. With a masterful eye, meticulous cleaning and a willingness to add bolts, Schlick opened over 40 pitches, with 25 personal first ascents. 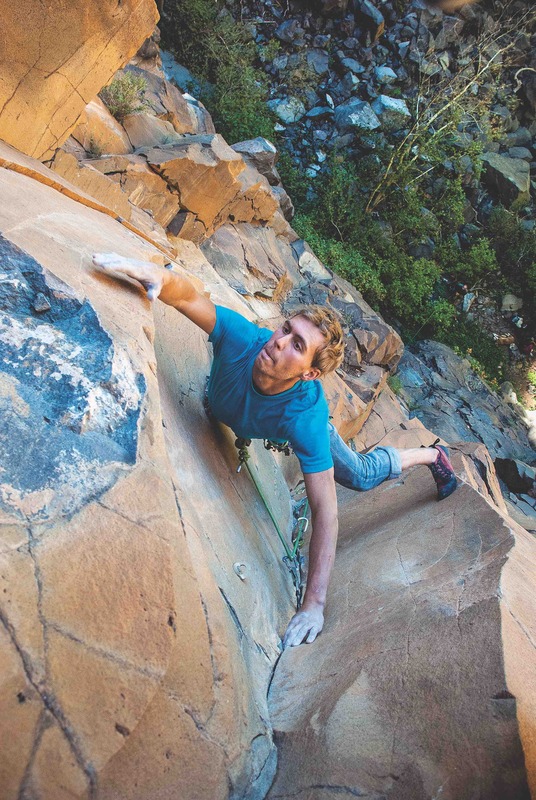 Together with Wade Forrest, James Q. Martin and a few others, he tackled the steepest and most featured stone of the Main Amphitheater, finding dozens of well-protected routes combining crack climbing, stemming and steep jug pulling. ABOVE: Eric Deschamps fights The Sword (5.10) at the Left Wall. During these golden years of the late 2000s, the Waterfall also gained its first 5.13 through the talented doctor Mike Sokoloff. He ended his short but productive time in Flagstaff by bestowing Parting Gift (5.13-), defined by a thin layback crux demanding equal parts balance, power and pain tolerance. In addition to burly thin crack climbs, many of the now-classic and well-traveled routes at the crag were opened during this time. From the bolted moderate Brother From Another Mother (5.10+) to mixed masterpieces like There Will Be Blood (5.12+), Schlick and crew connected features and put up new lines by the dozens. They set out on new terrain from the ground up, never knowing exactly what to expect. “I became a caretaker, a builder, a dreamer and a guide,” Schlick says. Schlick’s character and labor have left a deep impression on both the walls and those who now climb them. My introduction to the Waterfall came with several of Schlick’s routes, such as False Prophet (5.11c) and There Will Be Blood. After dipping my toes in the waters with these accessible climbs, I dove into the deep end, repeating every line I could. In 2011, I tried to repeat the recently opened Fierce Invalids (5.11) and found myself off route, in a desperately thin seam. Runout on bad RPs and a flared 000, beneath an improbably blank corner, I was committed—no, overcommitted— to an unintentional first ascent. Too pumped to downclimb and too scared to take, I had to go for it. ABOVE: Stemming hard to stretch it out Unema reaches for the jug on Death and Taxes (5.11+). In the seasons following, I teamed up with Bloom and John Crawley, quickly realizing that essentially every remaining corner system was climbable and protectable, and the faces and arêtes between the cracks offered quality climbing as well. Crawley’s ability to see between the cracks brought to life beautiful routes like Donald Duckin’ It (5.12d) and Earth Puller (5.13a/b), which climb laser-cut aretes with incredible friction and vicious micro-holds. While Crawley continued finding stellar bolted and mixed pitches, Bloom and I were drawn to the many unclimbed thin-crack systems, too tight to accept any body part, but wide enough to take Lowe-balls, RPs and 000 cams. Armed with stacks of gear more often used for aid climbing, we opened several of Arizona’s hardest gear lines. Bloom established Wolverine (5.13-), a fierce beast with back-to-back cruxes—a delicate smaller-than-tips layback and powerful pocket pull. Fueled by the energy of my partners and aided by a mild winter, I opened five new 5.13 pitches between September of 2013 and March 2014, including Gemini Dragonfire (5.13+), currently Arizona’s hardest gear route. Joel Unema, 27, is a writer and route developer based in Flagstaff. More of his work can be found at www.grassroutesclimbing.com.